Sericite sample having potash (K2O) content ~ 9% was evaluated as a source of potash. The mineralogical studies revealed the fine grain structure of sericite containing muscovite, orthoclase, and phlogopite as the major potash bearing phases. The feed sample directly leached in different lixiviants yielded low potash dissolution values. Planetary ball milling was carried out to liberate the potash values from silicate matrix. It was observed that the K-bearing phases were quite stable, with milling action of about 8 h yielded ~ 30% values. The heat treatment of sericite with NaOH resulted in ~ 90% K-dissolution at optimum conditions (60% flux, 600 °C, 30 min) with the formation of sodium silicate and kalsilite. 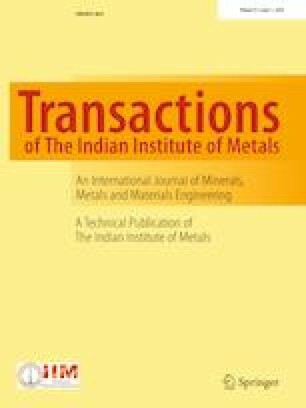 Mechanical activation had a positive effect on heat treatment kinetics as temperature decreased from 600 to 250 °C with ~ 100% potash recovery. CaCl2 and Na2CO3 were also evaluated as flux and based on a comparison of process variables and yield, NaOH was found to be the best flux. The authors would like to acknowledge the funding received from Ministry of Mines (Grant No. MOM-1004-MMED) and Science Engineering Research Board (Grant No. SER-1052-MMED) to carry out the research work.